Turkey season is officially here, and it’s time to get out there and start bagging some beautiful birds. There’s no better way to do so than with Wasp’s collection of elite, lethal broadheads. Our range of fixed-blade and mechanical broadheads is designed to provide you with an unrivaled edge in the field so you can take home the most memorable kills of your life. Shop our products today to see why nothing stings like a Wasp. Here’s a breakdown of the 2019 turkey season dates and bag limits for every state in the U.S. Season Dates: Arizona Game and Fish issues all permits through a public draw. Applications are due every fall. April 26-May 2 and May 3-23 for hunters drawing a Merriam’s or Rio Grande wild turkey tag; May 3-9 and May 10-30 for hunters drawing a Gould’s wild turkey tag. Archery season is April 26-May 30 depending upon hunt drawn by hunter. Youth-only season is April 19-25 and May 10-23. Over the counter/non-permit tag for archery is May 10-23. Bag Limit: One bearded bird per day; maximum of three per season. Season Dates: April 13 – May 26 statewide. Some game management units split this range of dates into two seasons; check regulations. Bag Limit: One bearded bird via an over-the-counter permit. Hunters may take an additional bird if they also draw a limited spring turkey permit. Season Dates: April 6 (youth); April 13 to May 11 (regular). Check regulations for public land permits and season segment dates (eregulations.com/delaware/hunting/; pages 26–27). All first-time Delaware turkey hunters must successfully complete a division-approved Turkey Hunting Safety Course. This includes both public and private hunters. To register for a classroom Turkey Hunting Safety Course, call the Hunter Education Office at (302) 735-3600. Delaware also accepts an online Turkey Hunting Safety Course. You can find the online course at www.wildturkeyhuntingcourse.com. Upon completion of the online course, contact the Hunter Education Office. Public Land Progress: The NWTF and the Indiana Department of Natural Resources have worked to create woodland meadow/opening maintenance through mechanical means and prescribed fire on the Hoosier National Forest benefitting Eastern wild turkeys. Bag Limit: One bearded turkey per permit or game tag (two total). Limited permits available in Unit 4. Bag Limit: Two bearded birds. A hunter may take a male turkey or a turkey with a visible beard. No more than one bird per day. No more than two birds per spring season. Any combination of male turkeys, or female turkeys with visible beards, may be included in this two-bird season limit. Turkeys taken by youth during the youth-only season count toward the spring turkey bag limit. Season Dates: Area A-April 6-May 5; Area B-April 6-28; Area C-April 6-21 (See rules and regulations). Refer to regulations for hunting areas and Wildlife Management Area/federal land seasons. Bag Limit: Two – one gobbler per day; two gobblers per season. The Louisiana Department of Wildlife and Fisheries prohibits the taking of hens, including bearded hens. Hunters are required to report their kill within 72 hours using the kill validation website, www.la.wildlifelicense.com, or by calling (888) 765-2602. Bag Limit: The spring season bag limit is one bearded turkey per day; two bearded turkeys for the season. Bag Limit: Two bearded birds; no more than one per day. Season Dates: Six time periods, beginning April 17 and concluding May 31 (lottery for first two periods). Archery and youth permits are valid during all time periods and all permit areas. 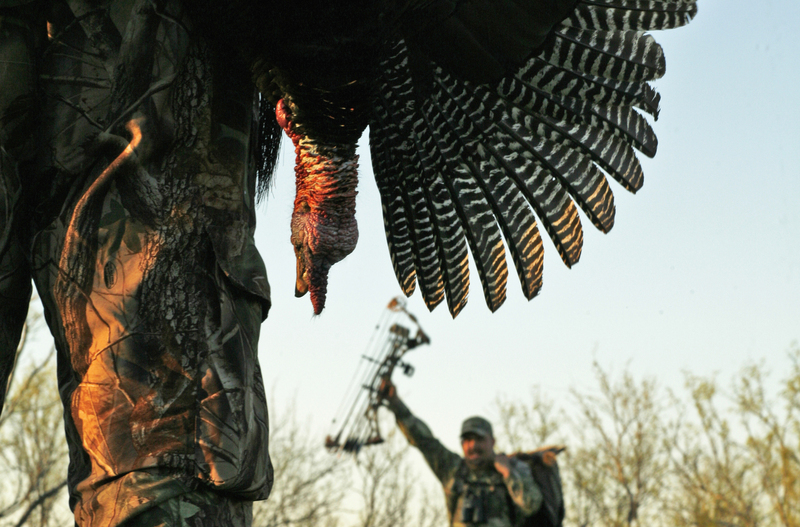 Bag Limit: One adult gobbler with a 6-inch beard or longer per day; three per spring season. Hunters aged 15 years of age or younger may harvest one gobbler of choice (any age) per day; three per spring season. Bag Limit: Two male turkeys or turkeys with a visible beard, only one of which hunters can harvest the first week. Only one bird during the youth season. Bag Limit: Nebraska Game and Parks allows hunters to purchase up to three permits in the spring, and each allow for the harvest of one male or female bearded turkey. Bag Limit: May 2019 season will allow a second gobbler in one of the state’s wildlife management units H1, H2, J2, K, L or M.
Bag Limit: The bag limit is one male turkey per permit, but the New Jersey Division of Fish and Wildlife allows hunters to take only one bird in a given day, regardless of the number of permits a hunter holds. Bag Limit: Two bearded turkeys, only one per day. The New York State Department of Environmental Conservation allows youth only one bearded turkey during youth season. Bag Limit: Two bearded turkeys. The North Carolina Wildlife Resources Commission allows youth to kill only one during youth season. Season Dates: Season dates vary. April 6-May 6 (April 22- May 6 in some southeast counties). Check regulations at https://www.wildlifedepartment.com/hunting/seasons. Bag Limit: Statewide bag limit is three. County limits vary, so check regulations at https://www.wildlifedepartment.com/sites/default/files/18OKAB-Hunting-PP4-RE_0.pdf. Bag Limit: One with a general license, two with the purchase of a special turkey license that hunters must purchase prior to April 27. Limit one per day. No Sunday hunting. Bag Limit: Three gobblers; no more than two per day. Some WMAs are more restrictive, so check regulations at http://www.dnr.sc.gov/regs/hunting/index.html. Season Dates: Season dates vary by county. Check local regulations for the county you plan to hunt at https://tpwd.texas.gov/regulations/outdoor-annual/regs/animal_listing. Season Dates: Youth season – April 6-7; General season – April 15-May 31. Spring seasons are for gobblers (males) and turkeys with visible beards only. Bag Limit: The combined spring/youth season limit is three birds. Hunters may kill only two turkeys in eastern Washington. However, they may kill only one in Chelan, Kittitas or Yakima counties. Hunters may kill one turkey per year in western Washington outside of Klickitat County. Hunters may kill two turkeys in Klickitat County. Bag Limit: One bearded or male turkey per harvest authorization.